Check out the qualification details as posted on Facebook. ATTENTION: The Bureau of Fire Protection (BFP) officially OPENS its Regular Recruitment for FIRE OFFICER 1 nationwide for CY 2018. The BFP will be recruiting (2,000) Fire Officer 1 Nationwide. Interested applicants are advised to personally submit their application requirements at their respective BFP Regional Offices starting June 04, 2018 until July 06, 2018. 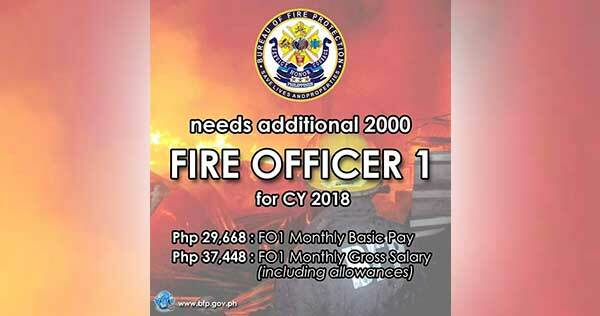 Successful applicants will be appointed to the rank of Fire Officer 1 (FO1) as a Uniformed Personnel of the Bureau of Fire Protection (BFP) and will receive a monthly basic salary of P29,668 upon oathtaking. A gross monthly income of P37,448 will be received including the monthly salary and allowances. Schedule of Oathtaking Ceremony for the successful applicants will be on October 01, 2018. 12. Must not have been convicted by final judgement involving moral turpitude. I. Certificate of Waiver granted by the Chief BFP (if applicable).